Up a hillside, shuttle service to the beach but only 3 times a day. Ten minute walk to the beach, feels like an hr coming back if you decide to walk. Family friendly hotel, plenty going on. Food was very good, a good variety and various changes daily. Beds made up every other day and towel change. Once your down the hill its a fair walk into Jandia up the strip. There are four shopping centers with plenty of shops and a few bars and restaurants. Hotel tip: Take an extra card with a magnetic strip on it. place it in the slot where your key card goes so as you can leave air con and fan on whilst you are out. 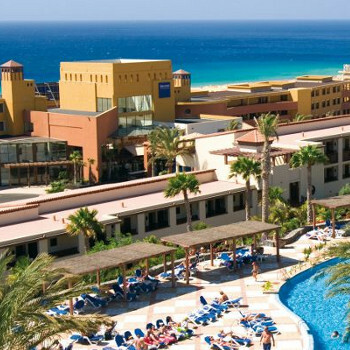 My daughter and I stayed at The Jandia Mar for 1 week from 4th June 2011. We arrived at the hotel around 10.30pm and the welcome we received was nice and swift. We were given our room key and hotel info and told a buffet had been laid on for us, all good so far. The room was lovely, spacious and clean and a view of the sea. Two plates of fruit had been left for us in the room, they were warm but a nice touch. We went down to the buffet and picked at the cold meats and vegetables left out for us. Unfortunately it was all down hill from the next morning when we attended breakfast. The food was awful, it was cold..everything was cold, eggs, bacon (streaky) and the teeny cocktail hotdog sausages. The plates were cold too so nothing was very appetising. There was also a selection of last nights veg including brussels sprouts to pick at if you really felt hungry.The evening meals were no different, repetative, bland and cold. The snack bar was the same every day, dry hamburgers, hotdogs, chips and salad. The leftover veg made into a flan. The best time to eat was at lunch as it always seemed fresher somehow and the pasta was nice. Back in the room we found a huge cockroach running round the room; it was the first of 4 unwelcome visitors. I might add that we were on the 5th floor. Outside and round the pool there were paper cups flying about in the wind, cigarette butts everywhere (no ashtrays) and at the pool bar I had to complain that my flipflops were sticking to the floor as people had spilt drinks and this mess had not been cleaned up. The flies enjoyed the atmosphere and dive bombed anyone who wanted to sit on the terrace or the pool bar. The hotel is on a very steep hill, ok to walk down but coming back in the heat was awful, we ended up either waiting on a bus or flagging a taxi. The beach is accessed at the bottom of this hill and you need to go through an underpass tunnel to avoid the road, it is a further walk to the beach/waters edge. This is not a 4 star hotel, the food makes it a 3 at best. The rooms are nice and the cleaners are good but the cockroaches just made us feel very uncomfortable. Would I go back..never! I've stayed at Barcelo hotels before, never had a problem AI but this has been a total let down. If only I had read the reviews elsewhere I would have booked The Thalisso Spa in Caleta de Fuste again instead. I led a party of seven adults. My wife and 2 daughters and their female friends. We arrived very late and tired on saturday evening at about 23:00 - the hotel reception staff couldn't have been more helpful. They checked all of us in quickly and efficiently and laid on some food for all us late arrivers - which was gratefully appreciated and a nice touch. We chose the all-inclusive package for convenience and to save the hassle of deciding and agreeing a restaurant. I must say we were glad that the food in the buffet style resaurant was so good and varied. There was plenty of choice so everyone was able to find something they fancied. I've read the other comments posted and agree that the fruit juices are really fruit based drinks (squash) and not all that good. However, we actually thought that the house wine was pretty good as were the fizzy drinks and cocktails. The hotel is very tidy and kept very clean. Every morning we saw the cleaners out en-masse sweeping and washing down the floors, so no complaints on that front. Our rooms were cleaned every day and the cleaners are very friendly and often left a few sweets on our pillow. I suspect that was because my wife and I are very tidy and made their job easy. My daughters and their friends didn't receive the same courtesy - but to be honest I'm not suprised as any of you who have teenage daughters will appreciate the mess they leave in their wake. The hotel is situated on a hill close to the beach (not on it though). There is a short 5 - 10 minute walk to the very nice beach. I've read some comments suggesting that this a tough walk - it isn't.You should walk down through the pool areas to the bottom of the resort then go down the lift to the parade of shops, under the tunnel and you are there. Beware of the beach chairs and parasols though. Although you at will to use them you will be charged about 3 euros for the chair and 1 euro for the parasol.The hotel is set away from the main tourist shop area. We found the walk absolutely fine though and you can get there in about 15 minutes tops. If you are looking for quality evening entertainment, I think that you are going to be dissapointed - it is truly pretty bad. However, we certainly didn't go to the Canary Islands for the night-life, so it didn't spoil our stay. During the previous 30 years, my wife and I have stayed at many Spanish hotels, ranging from 2-star to 4-star establishments. Standards in some of these hotels were rather disappointing. The food quality was relatively good but the variety was poor. We ventured out 1 night and ate in a restaurant down the road, self catering would be advisable. Our room was cleaned everyday but the surrounding areas, most especially the pool area, was untouched and this made us visit the beach on many occasions. All in all, the staff made our visit by being so accomodating and friendly but I would only advise this hotel on the basis of self catering. Please don’t believe some of the negative comments this is a well run hotel. We stayed between 1st and 8th of April via First Choice and were a bit worried when we were the only ones getting off the coach to the hotel. We were greeted with a friendly face at reception and the offer of a drink while completing the check-in formalities. We were allocated two good sized rooms next door to each other (numbers 411 & 412) one for me and my wife and the other for our daughter. Both the rooms had views of the sea, lovely bathrooms and large balconies. Rather than repeat everything that has already been said here are a few important things you should be aware of before you book. Hotel staff and in house animation team – very pleasant and enthusiastic. Food - generally good with plenty of choice, a cooked breakfast and well chosen evening meals. If you miss breakfast try the lunch which is underrated and is specially made rather than being regurgitated last nights evening meal. Meal times were very busy when we were there (just before Easter) but the restaurant coped OK . Wines and soft drinks are all on tap rather than from bottles but the standard was acceptable. For 7 Euros extra per person per day you could chose a la carte in a separate dining room but there were never more that half a dozen people in there so we didn’t try it. Drinks – local spirits and cocktails and contrary to some reports we never had to wait more that 30 seconds in the queue for alcoholic drinks. Evening entertainment - In the large theatre area entertainment was a bit patchy but not a bad as some have described. We had Beatles Tribute Band (great), Birds of Prey show, a modern dance group, a parrot show and for two evenings the enthusiastic animation team who, as they are not professionals played it for laughs. Individual musicians also perform in the Lobby Bar. Clientele - Mostly German but a considerable number of Spanish (I was pleased about that), some French and a smaller number of English. All were well behaved with no drunks or lager louts and I got the impression that the management don’t want those in the premises. At the “welcome meeting” we were told 2 English guests had to removed from the hotel in the past. It’s a steep hill to get to the hotel good if you want to get fit. The courtesy bus only goes to the bottom of the hill and straight back again but the local bus goes to other parts for 1 euro per trip. Disco in the Hotel - begins at 23.15 and is supposed to be strictly for the over 18s (although my daughter aged 15 got in without any trouble, I suspect because we accompanied her). Frankly the small disco area isn’t up to much unless you are in your 20s and 30s. It does have a uniformed security guard at the door controlling entry. My final comment is that we will have no reservations about returning to this hotel. Spent a fortnight at this hotel,and,despite the weather,which although dry was cloudier and windier than we have experienced before at this time of year,we thoroughly enjoyed our stay. CLEANLINESS-The hotel was spotlessly clean in all areas and the gardens were well maintained and tidy. FOOD-A good selection at all meals of with the best display of fresh fruit I have seen and the best choice of vegetables also.What a change to visit a hotel with crackers every night to go with the cheese.If there was a 4+ mark I would have used it,the only thing that stops me giving 5 was the tough "veal" and the occasional cold dish. LOCATION-We knew about the steep hill before we came,so the location of just a few hundred yards from the beach and 20 mins walk to the shops was ideal.The hotel runs a courtesy bus up and down the hill so if you time your outings you can avoid the hill. STAFF-Quite simply the friendliest staff we have ever encountered,and efficient as well. ENTERTAINMENT-Not very good most nights but the superb ABBA tribute and the energetic Grease show by the animation team push the score up to 3. The hotel itself is nice, clean (ish), nicely laid out. It was however in poor state of repair. Air-conditioning in our room did not work (a view shared by other guests we spoke to). We reported this problem at least 5 times and it remained broken. Food was very poor and repetitive. No very much choice, not very well prepared and repeated on a daily basis. The dining room was shabby and chairs were dirty. We even saw cockroaches. The bar was usually under staffed and took an age to get served in the evening. The bar staff worked hard and I even felt sorry for them, they're not miracle workers. All in all the hotel could have been excellent, the facilities are all there it just needs a whole new management system there to sort it out. The food was nice plenty of choice but could have been hotter at times. The night time entertainment was not to good except the singers in the piano bar a couple of nights. The Spa is excellent. The hill which we knew about was not to bad the courtesy bus was available but we left the hotel grounds by the back entrance and that was some of the hill missed out. Pros:- Very generous all inclusive, drinks not watered down and plentiful. Cocktails, hot lamumbas etc available too. Beer, red, white and rose wine, sangria, water and soft drinks all on tap to help yourself. Cava also plentifull on the all inc, from ealy evening bottles were available in the foyer to just help yourself (with fresh orange for bucks fizz if required). Food was varied and tasty, though only warm not hot. However, there was a microwave that you could use so not a problem. Indoor pool, gym and sauna available free. Massage extra cost. Hotel staff were lovely, polite and friendly, even when verbally abused by some clients (not English might I add). The sunbeds were always available as the rule of not reserving beds is adhered to and works well. The hotel is spotlessly clean, rooms, toilets and public areas too. Cons:- Only one barman serving at every bar but having said that the queues went down pretty fast. The hotel is a little spread out and if youre in a block far away it can be a bind if you forget something and have to trail back. As the weather was very bad while we were there this was a bit frustrating! Hotel is quite a walk from the centre of Jandia but wouldnt have been a problem if the sun had shined! Jandia as a resort is a little isolated unless you have a car, it takes a while to get anywhere on the bus.